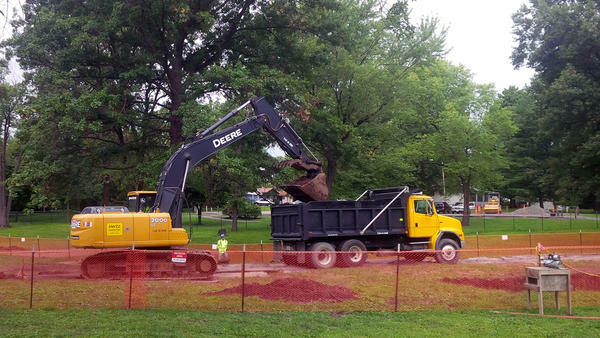 The Army Corps of Engineers cleans up St. Cin Park in Hazelwood in August 2015. The Army Corps of Engineers this month is preparing to remove radioactive soils from residential properties along Coldwater Creek for the first time. The Corps' St. Louis District found the contamination in yards on Palm Drive in Hazelwood in the summer of 2015. The planned remediation work, which officials expect to complete this fall, will affect five houses, one apartment complex and a Metropolitan Sewer District property. All are located within the 10-year floodplain. "We will be in there as long as it takes to remediate the soils that we have identified that need to be removed," said Bruce Munholand, chief of the Corps' Formerly Utilized Sites Remedial Action Program. The homes will still be occupied as officials perform their work. According to Corps officials, the contamination does not pose a risk to residents. The Corps detected low levels of contamination in the soil around the homes in summer 2015. The waste originated from nuclear weapons production in north St. Louis County in the 1940s. It was dumped in many areas around St. Louis, including Latty Avenue in Hazelwood and an area near Lambert St. Louis International Airport. Rain and flooding allowed the waste to travel into Coldwater Creek. At a public meeting hosted by the remediation program last month, officials also explained plans to clean up contamination on residential properties along Elm Grove Avenue that are adjacent to the creek. That work is slated to begin at the end of this year. "[Remediation] is important in order to ensure the future, long-term safety and health of the people and protection of the environment in the area," Munholand said. Nearby residents have raised concerns about the waste causing cases of cancer, autoimmune diseases and other conditions. The Agency for Toxic Substances and Disease Registry is working on a public health assessment for the area that's expected to be released in October.